It has been a while now since we have been talking about devices connected to the Internet and collecting huge amounts of data to be later processed for deriving value and information. Organizations have started to come out the hang of the buzzwords and started getting real about Big Data and Internet of Things. While they have data coming in from the social media, customer reviews, and so on, organizations are going the extra mile to make sure they collect data from wherever they can, under the impression that this data might be useful someday or the other. Other organizations are trying to capture data from various points in their supply chain, for an example, through the installation of sensors. These sensors are driving the generation of Big Data, and the Big Data technology is driving the use case of IoT for enterprises. Similarly, in the area of Manufacturing, organizations are beginning to get “Smart” with the use of sensors that possess the code for making decisions in case of emergencies and choosing a path of action when there are two. These advancements are leading industries to reduce manual and increase digital. Internet of Things is essentially the interconnection of objects with other object and with humans. These things can be cars, or simple household objects like dishwasher, with embedded technology in them that can help them interact with the external environment and drive the potential for a lot of use cases. Leading influencers in Big Data and Internet of Things believe that organizations should analyze how the Internet of Things will affect them and must respond to those analyses by establishing the right infrastructure to support these advancements. The key challenge in IoT related to Big Data is determining which information to store and which to throw away. The next challenge is determining for how long to store the data that was decided to be stored in the first place. These data management challenges, once tackled, will prove to be boon for industries. A large number of studies on Big Data, Internet of Things, and Data Analytics, and the convergence of these areas is creating several opportunities in various sectors for these technologies. Companies who already have Big Data strategies in place might want to adapt them to the changing need with the humongous data coming in from IoT. The most crucial aspect in IoT is still the ability to receive events from the Internet of Things devices. Soon enough, devices will be connected to each other using Bluetooth, Wi-Fi, and other such technologies. 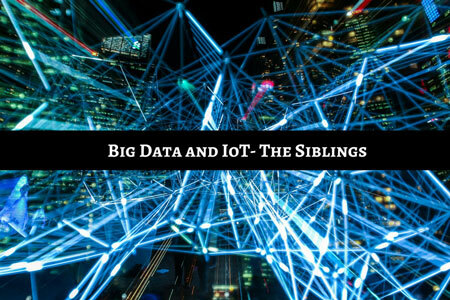 One issue that the two siblings- Big Data and Internet of Things face unanimously is that of security. The data that things will carry will vary from device to device. Some might carry data regarding communication protocols, others raw data and still others processed data. Since IoT is relatively new for security professionals they will have to learn a lot to be able to handle this area that needs their attention the most. Security threats are not just limited to the data, but also pose a risk to the attached device. Big Data and IoT will push organizations to make crucial changes to their security landscape to compensate for these newfound challenges. Once companies will have an efficient and secure IoT system that brings in raw and valuable data from multiple sources, enterprises will need to analyze the data for valuable insights. The size of the infrastructure, the performance, and the future growth are all the aspects that need to be taken care of while relying on an analytics platform. The two technologies came together and will thrive together too. Internet of Things needs Big Data analytics solutions and services to churn the data it so dearly collects and Big Data won't be that big without IoT. As these technologies find the balance in industries, the technology landscape of organizations will change for the better.